Hospice may be a foreign or even negative term to those unfamiliar with this service. We’ve assembled these resources to help you better understand what hospice is, who qualifies for it, and what it can do for you and your family. The focus of hospice is on caring for a patient, but not curing them. Hospice patients are those with an illness or injury limiting life, with a terminal diagnosis of 6 months or less. The goal of hospice care is to give the patient the highest quality of life possible, as long or short as they may live. Hospice care may be described as holistic in nature, nurturing not only the patient’s physical body, but his or her emotional, spiritual, cultural, and social needs as well. We consider the patient and family as a single unit, considering the needs of the whole family. To address all these needs, we use a team approach in providing nurturing care. Feel free to contact us with any questions or to set up a consultation. What regulations are there for hospice facilities? Hospice programs must meet state licensure requirements in order to deliver care. There are also federal regulations that must be met to be approved for Medicare reimbursement. Hospices are periodically inspected to be sure they meet these standards and can maintain their operative license and Medicare certification. 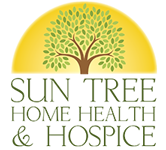 Sun Tree Hospice meets and works to exceed these standards. How soon can I start hospice care? Medicare’s rules for hospice reimbursement say that care should be started when a terminal diagnosis of 6 months or less has been made. Some patients are on hospice care for much longer than that. With however much time there is, Sun Tree Hospice works to get to know the patient and family and provide the best end of life care, so you can be comfortable and live life to the fullest possible. Who should make the decision to use hospice? Does it mean we’re giving up? The patient and his or her family ultimately make the decision, but the family physician may initiate the service. Choosing hospice care is not giving up, but accepting that you have a life limiting illness or injury and choosing to have palliative (comfort) care instead of curative care. Hospice allows you to live comfortably and focus on what matters most, spending time with family and friends and making wonderful memories that last forever. Can I still see my doctor? Certainly—your doctor can be part of our hospice team and fully part of your care plan. We also desire for you to feel empowered to make your voice heard and be part of the planning and decision making for your care plan. Where can hospice be administered? Can I change facilities? Hospice follows you to wherever you need or desire to be. Whether you’re in your own home, a family member’s or other private residence, a retirement home, assisted living facility, nursing home, or hospital, we can provide hospice care. You can change facilities and we will follow and even help with the arrangements to ensure your move is comfortable. What does hospice cover? Does it include medical supplies? Medicare’s hospice benefit covers all palliative (comfort) care treatment and equipment needs for your specific situation. This includes medications, hospital beds, walkers, wheelchairs, oxygen, and more. Please contact Sun Tree Hospice to discuss your particular needs. You pay nothing—Medicare covers 100% of hospice and all its benefits. Please contact our specialists at Sun Tree Hospice to discuss your Medicare/Medicaid benefit. What happens if a hospice patient starts to recover? Some patients respond to care and the illness goes into remission. Should that happen, the patient may return to curative care and be taken off hospice. If their condition worsens again, they can always come back to hospice care if they meet Medicare criteria.